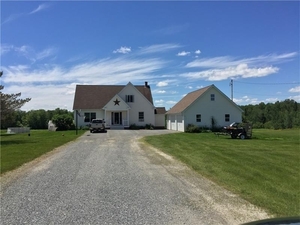 Privacy, peace & quiet and beautiful views.That is what you get with this beautiful custom, 4 BR, 2 bath cape home. Enjoy country living just a couple miles from downtown Presque Isle, hospitals, schools and parks. This home can provide one floor living if needed, with 2nd floor bedrooms and full bath as well. You can also finish the almost finished basement to provide increased living space for your growing family and add equity to your home. Large 2 car garage and generator back capabilities.